Small village with only 300 inhabitants 4 km north of Balatonakali. Rich in monuments, reflecting the fact that in medieval times it consisted of three independent settlements: Boldogasszony-dörgicse, Szentpéterdörgicse and Kisfaluddörgicse. 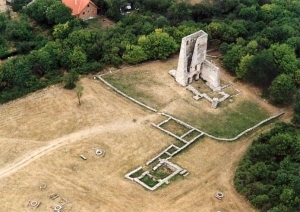 The church and monastery ruins of Alsó-Dörgicse built at the hill-side of Gernye hill which is the largest ruin edifice of Balaton highland, is visible from far away. Construction of the fortress church was commenced in 1251, and it was still used in 1738. The church ruin of Felsődörgicse (at the bend of the road) is hidden in the shade of the Lutheran church; it was first mentioned in records in 1082. During the Mongol invasion of Hungary it was destroyed, and then it was rebuilt enlarged. The small church ruin of Kisdörgicse is a real 'plainland church' i.e. it stands lonely in the middle of a pasture. It was built of basalt stones in Romanesque style in honour of Saint Nicholas in the 13th century. Today only the southern nave and a part of the western gable are visible from the church.